For You Designs is an Etsy store from New South Wales, Australia that features beautiful and distinctive handcrafted jewelry. Tasha Chawner the artisan/owner of For You Designs is a self representing artist. Tasha says that she is influenced by the world around her. The ever changing palette of Mother Nature inspires her to create original wearable art that will withstand the tests of time and fashion. Tasha has always had a passion for jewelry, color and design. 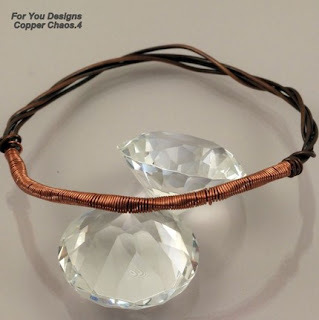 She challenges herself to create jewelry as beautiful and unique as you are. My favorites in her etsy shop are the Geometry earrings that she makes using mixed metals, and her Copper Chaos bracelets. 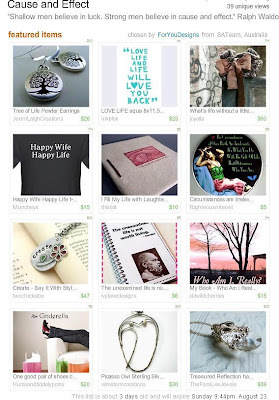 Tasha was kind enough to feature us in her recent etsy treasury Cause and Effect. Thank you Tasha. The Jewels love your work and are proud that you included us in such a lovely grouping. Thank you so much for the lovely mention on your blog, Bonnie!! I enjoy curating Treasuries. It's a wonderful excuse to spend far to much time looking at other artists wonderful work. And I love what you are doing with your Salvaged Style pieces. They are so unique and individual. You are welcome Tasha. I enjoy your work as well and your treasury gave me an excuse to highlight it.